Don’t be confused about the differences between a receptacle and a plug. This article reviews the common receptacle, the types available and their uses. No more scratching your head in the hardware store trying to decide whether you need to buy a plug or a receptacle! When purchasing materials for your home wiring project, there are some key facts that you must know in order to ensure that you are purchasing the correct items – things like proper size (generally wattage, amps, volts, wire size, type, etc. ), using the proper terminology, differences between manufacture types, and more. Knowing this information upfront will save both yourself and the home improvement store clerks some time and frustration. Sandy and I are very familiar with this topic, as we are the ones that have to ask the pertinent questions when people come in to our lighting and electrical supply store looking to purchase their electrical materials. I wish that I had a nickel for every question I’ve heard asked of the store clerk, or have answered myself while shopping for material either at the local hardware store, or in the electrical aisle of the home improvement box stores. More often than not, the customer either pulls out a cell phone to try and get the proper information, or leaves the store to return home to gather more information. Sound familiar? If so, you should find this series very useful. It’s NOT a Plug – it’s a Receptacle! 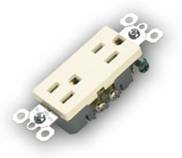 Normal utility grade outlets for household use are a 125V 15A straight blade receptacle (NOT a plug!) Many people refer to a receptacle as a plug. A plug is a male cord end that you insert into a receptacle. The NEMA (National Electrical Manufacturers’ Association) configuration and designation is a NEMA 5-15. What style of receptacle do you need? The most common is a standard style duplex receptacle (Figure 1). The other likely choice would be Decora, or decorator style (Figure 2). These are the rectangular shaped receptacles that use the same cover plate as the switches in the same style. The most common in older homes is ivory. Within the past several years, white has taken over as the standard. However, most manufacturers are expanding the number of different colors available, and you can get light almond (very close to ivory), brown, black, blue, and red, just to name a few. If you are replacing several outlets, this may be a good time to consider upgrading all of the outlets, or one room at a time, especially if this is a part of a redecorating or renovation project! You may find a range of $0.50 to $15.00! Why the difference you ask? The cheapest way to purchase the replacement will be in a job pack or contractor pack consisting of 10 or so devices packaged together. You will pay more for the same device individually, and you also may see a heavy-duty receptacle that could be up to $10 – $15! These are specialty outlets that could be isolated ground receptacles (will likely be orange in color as shown in Figure 3), or commercial or spec grade receptacles. A device of this quality may be considered for either a shop or garage receptacle that may be used frequently to plug in power tools or other heavy loads, or possibly in the kitchen, but remember that you can replace a lot of the standard grade receptacles for the price of one spec grade receptacle, so economically, it may not be worth the price difference. Do you need a new cover plate? You need to consider the color (some people will choose to have a different color of plate than the device, but most match them up), and do you want the standard hard plastic plates, or the more pliable and less breakable nylon plates? Again the choice of Decora style, or standard duplex style, depending on the receptacle that you picked. If you have too large of an opening in the wallboard around the device box and a normal plate won’t cover it up, instead of more patching and painting, an ‘oops’ plate may be available to help you out. These are over-sized plates that are made for this purpose. So who would have thought that there are so many questions that you need to answer just to purchase a new receptacle? Things will get even more involved when we move on to other devices in future articles. 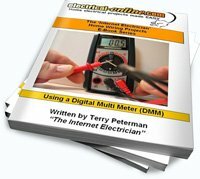 This entry was posted in Receptacles and tagged 125V, 15A, amps, Association, commercial grade, contractor pack, cover plate, decora, decorator style, do-it-yourself, duplex, electrical, electrical wiring projects, home improvement, National Electrical Manufacturers, NEMA, NEMA 5-15, oversized plates, receptacle, spec grade, standard grade, standard style, straight blade, volts, wall outlet, wattage, wiring. Bookmark the permalink.